Skywest Flight 5569, a Fairchild Metroliner SA-227-AC, was positioned on runway 24 left at Los Angeles International Airport (LAX), and awaiting clearance for take-off from air traffic control. As the aircraft waited, USAir Flight 1493, a Boeing 737-300, inbound from Columbus, Ohio, was cleared for a visual approach on runway 24 left. Just after touchdown, the 737 collided with the Metroliner that was still waiting in position. The collision occurred simultaneously with the aircraft's nose wheel contacting the runway. provide adequate direction and oversight of air traffic control facility managers. The investigation also believed the FAA failed to provide effective quality assurance of the Air Traffic Control (ATC) system. All 12 passengers and crewmembers aboard the Skywest flight were killed. 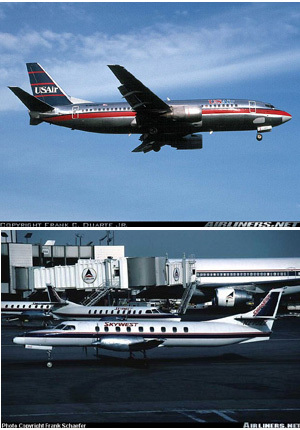 Twenty-two of the 89 passengers and crew on the USAir flight were killed.